More rats / souris today! 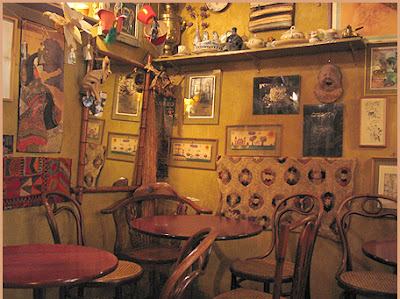 Well chocolate rats only... More Paris cafes! And more HOT CHOCOLATE with Corey of Tongue in Cheek. With limited hours - 2 to 8 PM. Only open on Thursday through Sunday. When you visit a wizard's parlor, you don't expect regular hours do you? 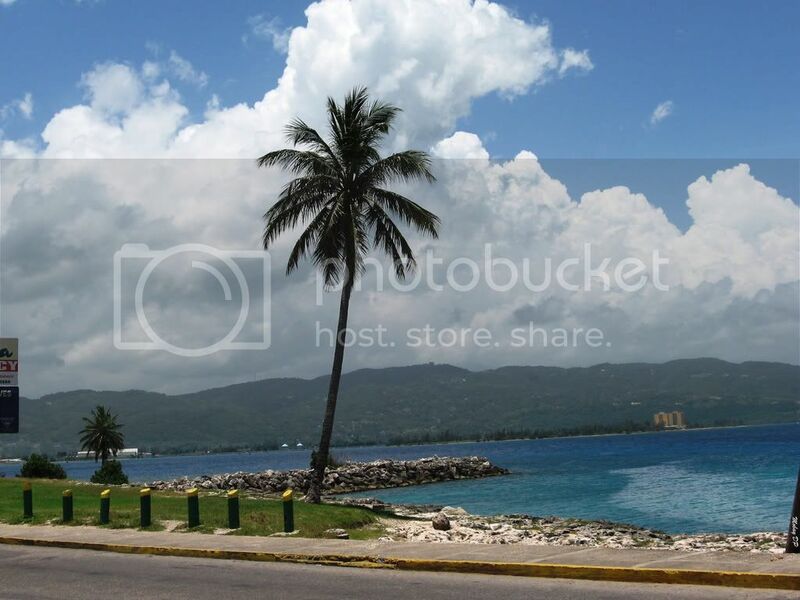 This picture is courtesy of the La Charlotte de l'Isle website.. The divinely thick hot chocolate! 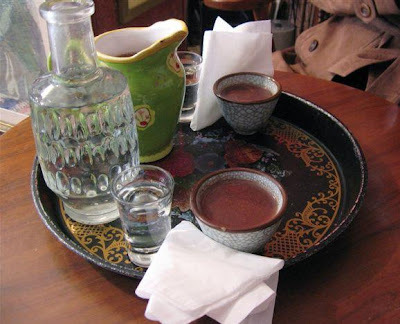 In perfect Japanese tea bowls with a Moroccan-style pitcher! 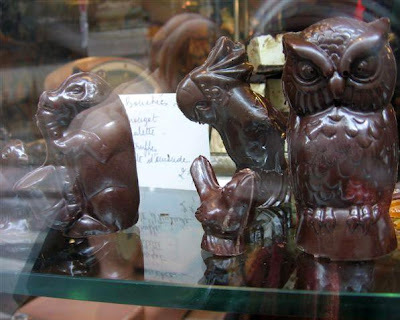 La Charlotte de l'Isle is famous for it's antique chocolate molds. There's quite a bit of controversy about where you begin to eat a chocolate rabbit.. The ears is the preferred method. Couldnt help myself. The French will make chocolate into anything wont they!!?? Goodness. oooooooooh my! That hot chocolate looks so good...even though it's so hot in California! oh...and I'll just be taking that Moroccan-style pitcher home with me! 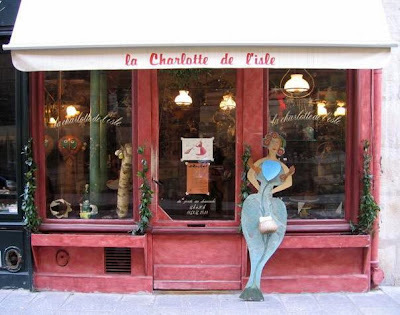 Now I'm all for wonderful chocolat shops like this one especially as it shares it's name with my little Parisian daughter and I really don't mind a cup of thick hot chocolat but eating a rat - NON! Finally - I now know why it is always shut when ever I pass it. Those Rats and that Mermaid make me extreemly happy! Correction: I found your site from Merisi's site, and her site is listed with David McMachon's authorblog! 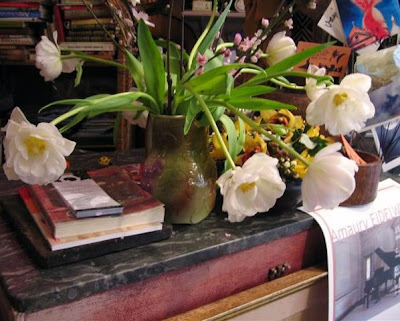 Pretty shop, romantic and delicious! oh my, is that not the cutest ever shop? magical, it really looks like that! And, although rats are NOT my fav, ever, these look really cute! 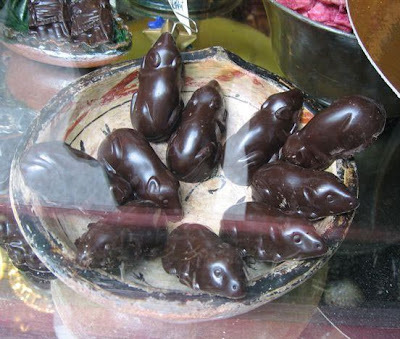 I must confess that as much as I love chocolate I do not think I would be able to eat these chocolate rats! Of COURSE there is no milk chocolate here. 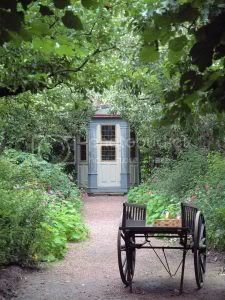 This is one of my favorite places in Paris. I love it. 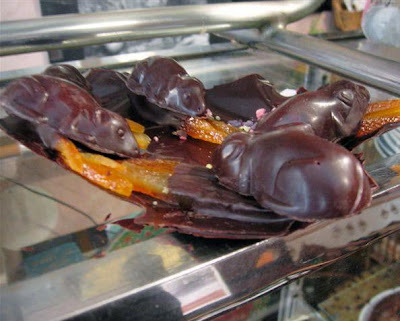 Regardless of the success of RATATOUILLE, I still would have to work at wanting to eat a chocolate rat... yikes! I have just came across your nice website when I was googling. I have read some of your posts in the past and enjoyed your beautiful watercolours, they got me interested in making some comment. I'm so trying not to drool all over myself... yum. Now this is my kind of cafe! 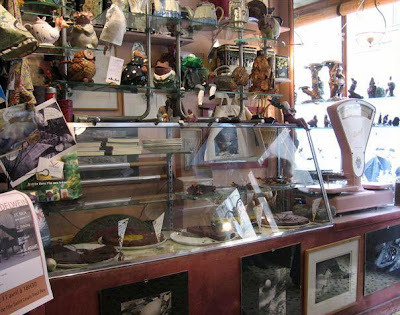 Chocolate rats, antiques and atmosphere!!! 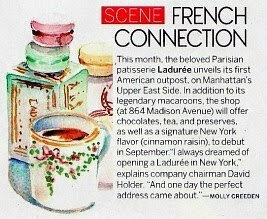 Oh La La... Will you paint a rat??? 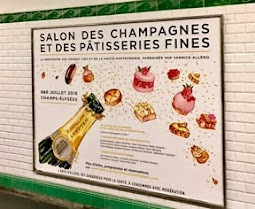 I think I could enjoy these type of rats~how clever the French continue to be-God bless them!A place I must not miss on my next visit! thanks ! Rats.....unfortunately I associate them with NYC subways! Not with chocolate. Maybe if I close my eyes....I wonder if you can buy them here in the city, Carol? 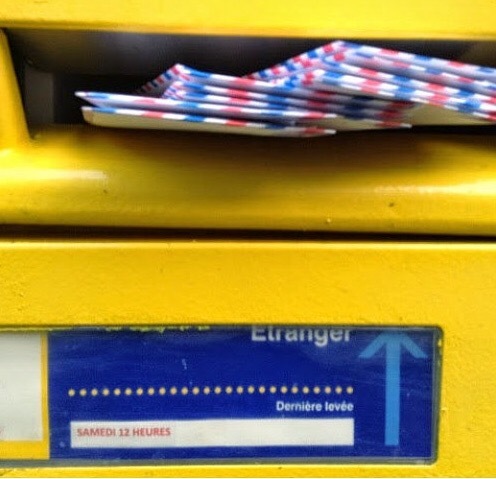 Thanks for posting these lovely Paris photos. It felt like a mini vacation via the web. 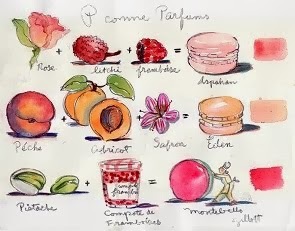 Enjoy your delicate touch with the watercolors. 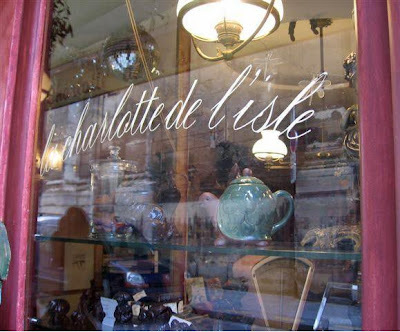 I went in search of Charlotte's in the summer of 2000 with another art professor. 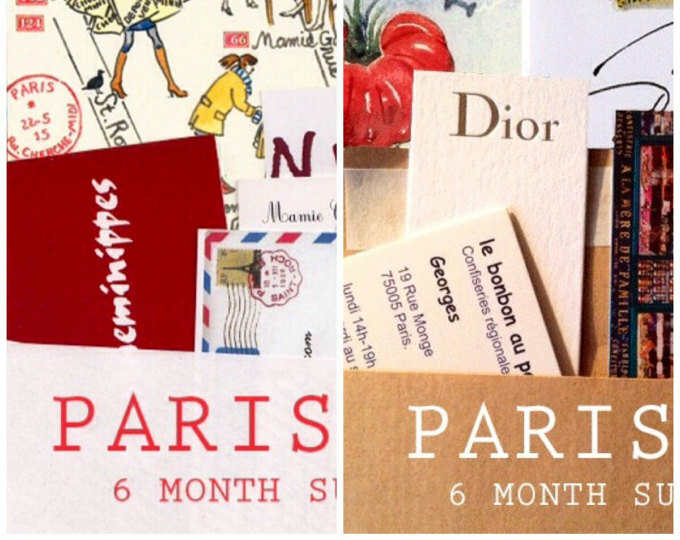 Had read about in Lonely Planet Paris. The hot chocolate was so good I thought I was on drugs. And we lucked on the hours - a wonderful old French woman was playing the piano with all the enthusiasm of Mozart. The experience was incredible - we brought a flute professor there the next year when I took a group of art students. I still dream of the hot chocolate and can't wait to return. Why I Love Ice Cream!